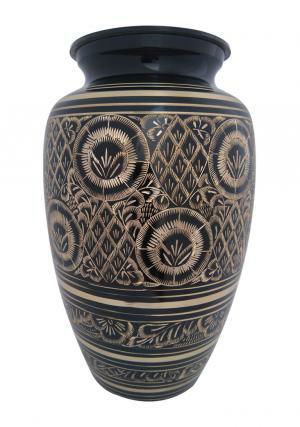 Radiance elegant adult black urn is highly engraved with flower presence as a decorative field engravings finished in brass gold. The large adult is rounded with golden bands beautifully and well engraved leaves covered as the layers of decoration. 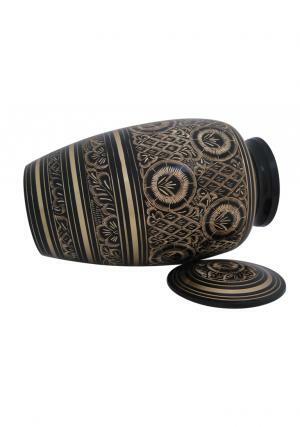 The radiance elegant adult funeral urn is made of quality brass and engraved from skilled professional with nature of ancient artwork presence in decoration. 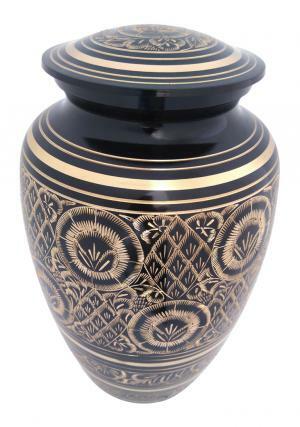 The large adult radiance black cremation urn has screw threading layer to the neck and lid. the screw threading is used to open and preserve ashes of loved ones as well as securely close top of the urn. The adult radiance urn is measured of 2.04 Kg in weight (empty) and carries approximately 200 cubic inch of human ashes. 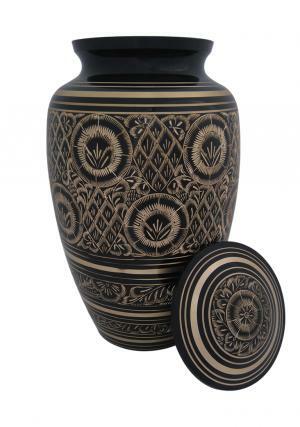 The dimensions of radiance adult black memorial urn are 10.24 inches tall in height, 6.3 inches of width and length.